Last Sunday marked the last day of meat consumption for Orthodox Christians until Pascha, the “Meatfare Sunday”, also known as the Sunday of the Final Judgement. So, we have a week with modest alcohol intake and no meat until Cheesefare Sunday this weekend, after which we drop dairy products and alcohol from our diet. Metropolitan Nektarios of Hong Kong has produced a series of presentations on Lenten themes that are concise and authoritative; his first is presented here, discussing the first day of Lent, Clean Monday, and the fasting regime that follows under the direction of a spiritual father. This week, most observant Orthodox Christians will abstain from eating meat or fish, and this Sunday (“Cheesefare Sunday”) the Lenten Fast begins in earnest as dairy products and alcohol are excluded from the diet, which we have discussed before here, here, here and here. 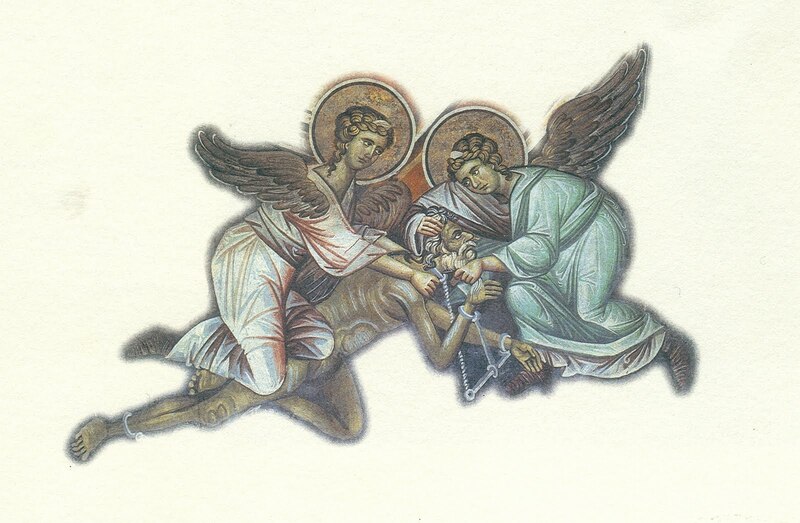 Father Joseph Fester, whose mission to Tbilisi’s Anglophone population is based at the Blue Monastery in Tbilisi, has written a very concise and authoritative guide to the Lenten Fast. It is provided below. One of the great beauties and strengths of the Orthodox Christian Faith is our invitation to take full spiritual advantage of her Lenten Seasons. The Great Fast in preparation for the Feast of Feasts, the Pascha of our Lord, God and Savior Jesus Christ is the model for all fasting periods in the Church’s liturgical cycles. The length of the Great Fast is important for a believer. It invites us to reshape our daily lives, to live differently, act in a higher and better way and offer the time of the Fast up to God as a sacrifice of praise. It challenges us to live our daily lives at work, with family and friends with a first-offering of good to others. It can move us to hold our tongue, practice patience and being non-judgemental to those we know and those we don’t. It presents to us the opportunity to become more of the person that God created us to be. As important as fasting is, it cannot reap spiritual benefit unless we couple it with an increase prayer. Prayer is not easy, in fact it can be very difficult. The Evil One hates when we pray and will do whatever he can to distract us from being in communication with God for he knows that when we devote time in our day toward God, he is given less room to work in our lives and actions. The Church recognizes this in the very shape of her Lenten liturgical structure. The first week of the Great Fast is full of services, the centre being the Great Canon of St. Andrew of Crete. The first three days of Lent are called to be intense days of prayer and fasting which anticipates our reception of the Presanctified Gifts on Wednesday of the first week of Lent. Then we quickly again hear the Great Canon of St. Andrew on the Thursday of the first week and again we are invited to partake of the Presanctified Gifts on the Friday of the first week. These corporate chances to gather as Church to worship the Lord must be coupled with increased personal prayer by believers. Whatever our private prayer life is during the rest of the year, we are called to increase it during the Great Fast. This invitation is the fuel that keeps us close to God. Our rule of prayer must be realistic. It should not be so rigid that we will give up, yet it should be more than we do already. If do we little now, then add to it. If we do more, build upon that foundation. The goal should be to carve out more time to be in the presence of God in prayer. If we stumble, get back up and begin again. If we fall, don’t stay down but climb to our feet and stand before the Lord. Often we can be tempted to take the easy path when fasting. We may say we will “give up meat” for the Fast or meat and dairy. Certainly that is a profitable spiritual exercise. It is time-tested and the monastic experience of such strict fasting is well documented. The monastic life, especially in community, lends itself to mutual support for this order of fasting but it is sometimes not possible for those who “live in the world,” most of us. Thus our fasting must take this into consideration. This does not mean that we should simply reject the monastic fasting model but we should also look to the spirit of that model. The spirit reveals that we can do with less physically so that we can make more room for the spiritual. As elevated as the parish model is when it comes to the liturgical life, the monastic model is even more intense. This is so because it compliments the rigours of the monastic fast – prayer and fasting going hand in hand, one sustaining the other. This also can be and should be done by non-monastics. Whatever our increased prayer and fasting rule is during the Great Fast, it is called to be a done with a spirit of grace and joy. Increased prayer and fasting is NOT a burden but rather a liberation for the believer. Such efforts can show us a glimpse of the Kingdom of God, which is Spirit-filled and Life-Giving. Orthodox do nothing without preparation; even the Great Fast does not start all at once. In the preparatory Sundays before the Great Fast we are given essential spiritual themes to begin our reorientation back to God. The desire of Zaccheaus to see Christ, the humility of the Publican, the repentance of the Prodigal Son, and the unconditional love of the Father upon his return. We are commanded by God to care for the least of the brethren on the Sunday of the Last Judgement and then finally, on the very eve of the Great Fast, we are commanded again to forgive. In many parts of the Orthodox Church the service of Forgiveness Vespers is served on the night before the Great Fast and then the clergy and faithful embrace one another, one-by-one and ask each other for forgiveness so that nothing stands between us as we journey to the Pascha of our Lord. In the same way, the Church offers us a fast-free week during the week of Publican and Pharisee, then She, step by step, reduces our physical attachment to the world with a week of normal fasting on Wednesday and Friday, then relieves us of attachment to the physical by inviting us to abstain from meat on Meatfare Sunday and then on the last Sunday before the Fast to abstain from dairy products on Cheesefare Sunday. This gradual preparation affords us to get ready and prepare for the sustained spiritual effort of the Great Fast. Each, according to their ability should make a Lenten Plan. We should decide after much prayer what we will try and accomplish during the Great Fast. This must include both how we will fast and how we will pray. Whatever our personal plan, it should be achievable. No athlete just starts running a marathon, rather she starts out with a plan to reach the goal. Too often, in our spiritual enthusiasm we set a goal that will be easily defeated by our first stumble and then the Evil One will step in and distract us from continuing. Make a plan that you can keep. You can always increase your fasting and prayer routine as you gain spiritual strength, but try not to set an unrealistic plan from the start that you wont’ be able to keep. These suggestions are not perfect for everyone but may contain some ideas that one can apply to their Lenten Plan. 1. Make a maximum effort during first week of the Fast. Getting off to a good start is important. Fast as much as you can. Pray as much as you can. Don’t give up if you fall. Start over again. 2. During the Week of the Cross, again try and ramp up your prayer and fasting like you did during the first week of Lent. The Cross is given to us at the mid-point of the Fast to encourage us to press forward to the Empty Tomb of our Lord. 3. Then, during Holy Week, take all the spiritual growth you have gained and apply it to these most holy days. Consider the Great Fast as a spiritual athlete. Mark out this time as a special time in your spiritual training. See how, with God’s grace, you can be a better Orthodox Christian going forward, building upon the gains you have made during Lent and then living them forward. There are so many other things that I have not touched on that are equally important, but I am sure you know what they are, going to Confession early and often during the Great Fast; receiving the Holy Eucharist as often as possible during the Great Fast; and reordering our daily routine so that you can be given strength by these two pillars of Orthodox Life. Above all, be joyful during the Fast. Seek the freedom that comes from being less attached to this world and more a citizen of the Kingdom of God. We are His children and we are all brothers and sisters in Christ. A family with Him as Our Father, who loves us and desires more than anything that we will live with Him Forever. May our efforts bring us closer to God and each other and by our Love may the Kingdom of God be revealed to others seeking the Hope that is in us. Yesterday, the fasting period associated with Mariamoba, or the Dormition of the Virgin Mary, began. As is normal for Orthodox people during fasting periods, we slow down the pace of our social engagements and focus upon prayer, contemplation, and simplification of our lifestyle. Weddings are not conducted during this two-week period. Part of the simplification of lifestyle involves a modified diet, with alcohol and rich foods eliminated for a period of time. Fasting traditions vary between jurisdictions, and a priest’s advice may modify the prescriptions depending upon what the priest considers appropriate for the individual concerned. As a general rule, from August 13 until Mariamoba on August 28, we abstain from meat, eggs, dairy products, fish and alcohol. An exemption is given on the Feast of the Transfiguration on August 19, when fish and alcohol may be consumed in moderation. Given that the Transfiguration coincides with the beginning of Georgia’s grape harvest for wine production, this is a very poignant and reasonable concession, given the very strong cultural affinity with wine that Georgians have. 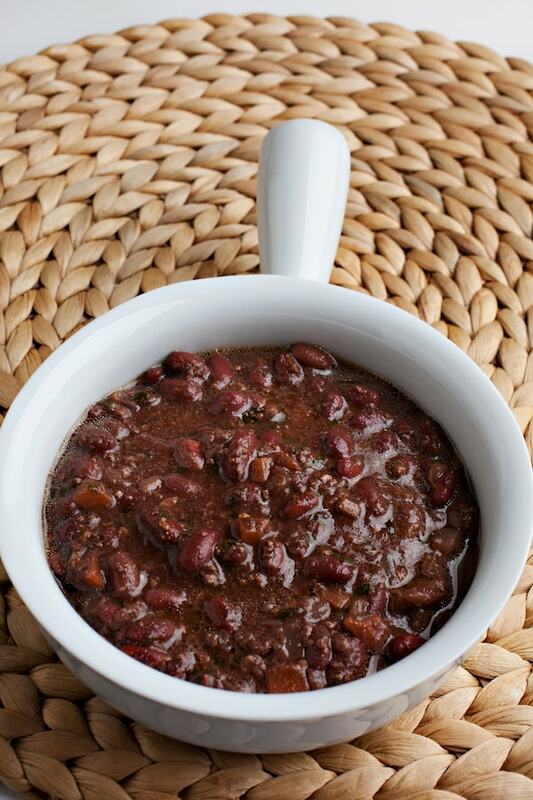 For an excellent resource on Georgia’s wide variety of vegetarian cuisine, I would suggest you visit http://www.georgianrecipes.net ; which has excellent instructions on how to prepare these tasty dishes. While often served in people’s homes, it is a pity that restaurants only serve a handful of these dishes routinely in Georgia. Wine consumption on Saturdays and Sundays is also permitted in moderation. Today marks the beginning of the Nativity Fast, which runs for forty days until the great Feast of the Nativity of the Lord (Chistmas) on January 7. It is also known by the Slavs as Saint Philip’s Fast, as it commences on Saint Philip’s Day, today. The Nativity Fast is not as rigourous as the Lenten Fast; there are days of the week when wine and oil may be consumed, and some days when fish may be eaten. The purpose of the Fast is to facilitate prayer, to simplify our lives while preparing for Christ’s arrival, and to create a strong sense of anticipation for the joyous celebration to come. 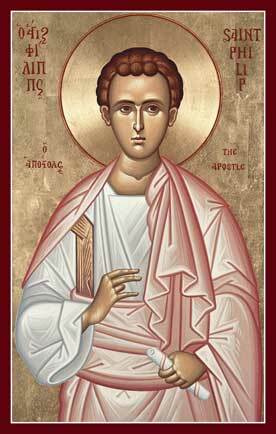 The Apostle Philip was one of the Twelve Apostles. He was martyred in present-day Turkey, and his tomb was discovered in Heirapolis in Denizli province in 2011. “Philip was born in Bethsaida beside the Sea of Galilee, as were Peter and Andrew. Instructed in Holy Scripture from his youth, Philip immediately responded to the call of the Lord Jesus and followed Him (John 1:43). After the descent of the Holy Spirit, Philip zealously preached the Gospel throughout many regions in Asia and Greece. In Greece, the Jews wanted to kill him, but the Lord saved him by His mighty miracles. Thus, a Jewish high priest that rushed at Philip to beat him was suddenly blinded and turned completely black. Then there was a great earthquake, and the earth opened up and swallowed Philip’s wicked persecutor. Many other miracles were manifested, especially the healing of the sick, by which many pagans believed in Christ. Today, Meatfare Sunday, is the last day upon which Orthodox Christians eat meat before the start of the Fasting Season of Great Lent. Traditionally, it is also the day upon which we focus on the Second Coming of Christ, and the Final Judgement of the Living and the Dead. The noted theologian Saint John Maximovitch of Shanghai was very interested in Eschatology (the study of the End Times) and delivered this homily on Meatfare Sunday. Given that the Book of Revelations is rarely read out during the Liturgy, it is through such homilies that Christians become aware of what events lie ahead before Christ’s Second Coming. “The day of the Last Judgement! That day no one knows — only God the Father knows — but its signs are given in the Gospel and in the Apocalypse of the holy Apostle John the Theologian. Revelation speaks of the events at the end of the world and of the Last Judgement primarily in images and in a veiled manner. 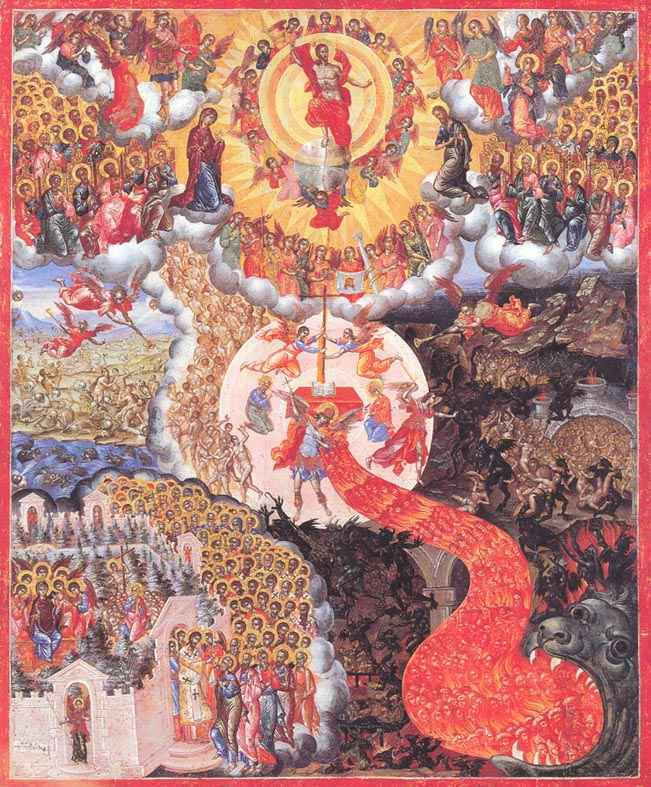 However, the Holy Fathers have explained these images, and there is an authentic Church tradition that speaks clearly concerning the signs of the approach of the end, and concerning the Last Judgement. Before the end of life on earth there will be agitation, wars, civil war, hunger, earthquakes… Men will suffer from fear, will die from expectation of calamity. There will be no life, no joy of life but a tormented state of falling away from life. Nevertheless there will be a falling away not only from life, but from faith also, and “when the Son of Man cometh, shall He find faith on the earth?” (St. Luke 18:8). Men will become proud, ungrateful, rejecting Divine law. Together with the falling away from life will be a weakening of moral life. There will be an exhaustion of good and an increase of evil. Of these times, the holy Apostle John the Theologian speaks in his God-inspired work, the Apocalypse. He says that he “was in the Spirit” when he wrote it; this means that the Holy Spirit Himself was in him, when under the form of various images, the fate of the Church and the world was opened to him, and so this is a Divine Revelation. The Apocalypse represents the fate of the Church in the image of a woman who hides herself in the wilderness: she does not show herself in public life, as today in Russia. In public life, forces that prepare the possibility for the appearance of Antichrist will play the leading role. Antichrist will be a man, and not the devil incarnate. “Anti” means “old,” and it also signifies “in place of” or “against.” Antichrist is a man who desires to be in place of Christ, to occupy His place and possess what Christ should possess. He desires to possess the attraction of Christ and authority over the whole world. Moreover, Antichrist will receive that authority before his destruction and the destruction of the world. What is known of this man — Antichrist? His precise ancestry is unknown: his father is completely unknown, and his mother a foul pretended virgin. He will be a Jew of the tribe of Dan. He will be very intelligent and endowed with skill in handling people. He will be fascinating and kind. The philosopher Vladimir Soloviev worked a long time at presenting the advent and person of Antichrist. He carefully made use of all material on this question, not only Patristic, but also Muslim, and he worked out a brilliant picture. Before the advent of Antichrist, there was a preparation in the world, the possibility of his appearance. “The mystery of iniquity doth already work” (II Thes. 2:7). The forces preparing for his appearance fight above all against the lawful Imperial authority. The holy Apostle Paul says that Antichrist cannot be manifested until “what withholdest is taken away” (II Thes. 2:6-7). St. John Chrysostom explains that the “withholding one” is the lawful pious authority: such an authority fights with evil. For this reason the “mystery,” already at work in the world, fights with this authority; it desires a lawless authority. When the “mystery” decisively achieves that authority, nothing will hinder the appearance of Antichrist any longer. Fascinating, intelligent, kind, he will be merciful — he will act with mercy and goodness; but not for the sake of mercy and goodness, but for the strengthening of his own authority. When he will have strengthened it to the point where the whole world acknowledges him, then he will reveal his face. For his capital, he will choose Jerusalem, because it was here that the Savior revealed His Divine teaching and His person. It was here that the entire world was called to the blessedness of goodness and salvation. The world did not acknowledge Christ and crucified Him in Jerusalem; whereas, the whole world will acknowledge the Antichrist’s authority and Jerusalem will become the capital of the world. Having attained the pinnacle of authority, Antichrist will demand the acknowledgement that he has attained what no earthly power had ever attained or could attain and then demand the worship of himself as a higher being, as a god. V. Soloviev describes the character of his activity well, as “Supreme Ruler.” He will do what is pleasing to all — on the condition of being recognized as Supreme Authority. He will allow the Church to exist, permit her Divine services, promise to build magnificent churches…, on the condition that all recognize him as “Supreme Being” and worship him. Antichrist will have a personal hatred for Christ; he will see Him as a rival and look upon Him as a personal enemy. He will live by this hatred and rejoice in men’s apostasy from Christ. Under Antichrist, there will be an immense falling away from the faith. Many bishops will change in faith and in justification will point to the brilliant situation of the Church. The search for compromise will be the characteristic disposition of men. Straight-forwardness of confession will disappear. Men will cleverly justify their fall, and gracious evil will support such a general disposition. There will be the habit of apostasy from truth and the sweetness of compromise and sin in men. Antichrist will allow men everything, as long as they “fall down and worship him” and the whole world will submit to him. Then there will appear the two righteous men, who will fearlessly preach the faith and accuse Antichrist. According to Church tradition, they are the two Prophets of the Old Testament, Elijah and Enoch, who did not taste of death, but will taste it now for three days, and in three days they must rise. Their death will call forth the great rejoicing of Antichrist and his servants. Their resurrection will plunge them into great confusion and terror. Then, the end of the world will come. The Apostle Peter said that the first world was made out of water — an image of the primordial chaos, and perished by water — in the Flood. Now the world is reserved unto fire. The earth and the works that are therein shall be burned up (II Peter 3:5-7, 10). All the elements will ignite. This present world will perish in a single instant. In an instant all will be changed. Moreover, the Sign of the Son of God, the Sign of the Cross, will appear. The whole world, having willingly submitted to Antichrist, will weep. Everything is finished forever: Antichrist killed, the end of his kingdom of warfare with Christ, the end, and one is held accountable; one must answer to the true God. “The end of the world” signifies not the annihilation of the world, but its transformation. Everything will be transformed suddenly, in the twinkling of an eye. The dead will rise in new bodies: their own, but renewed, just as the Savior rose in His own body and traces of wounds from the nails and spear were on it, yet it possessed new faculties, and in this sense it was a new body. It is not clear whether this new body will be the same as Adam was made, or whether it will be an entirely new body. Afterward, the Lord will appear in glory on the clouds. Trumpets will sound, loud, with power! They will sound in the soul and conscience! All will become clear to the human conscience. The Prophet Daniel, speaking of the Last Judgement, relates how the Ancient of Days, the Judge sits on His throne, and before Him is a fiery stream (Daniel 7:9-10). Fire is a purifying element; it burns sin. Woe to a man if sin has become a part of his nature: then the fire will burn the man, himself. This fire will be kindled within man: seeing the Cross, some will rejoice, but others will fall into confusion, terror and despair. Thus, men will be divided instantly. The very state of a man’s soul casts him to one side or the other, to right or to left. Conversely: the same words will call the fire of horror and torture to those who did not desire Him, who fled and fought or blasphemed Him during their lifetime! The Last Judgement knows of no witnesses or written protocols! Everything is inscribed in the souls of men and these records, these “books,” are opened at the Judgement. Everything becomes clear to all and to oneself. When “the books are opened,” it will become clear that the roots of all vices lie in the human soul. Here is a drunkard or a lecher: when the body has died, some may think that sin is dead too. No! There was an inclination to sin in the soul, and that sin was sweet to the soul, and if the soul has not repented and has not freed itself of the sin, it will come to the Last Judgement with the same desire for sin. It will never satisfy that desire and in that soul there will be the suffering of hatred. It will accuse everyone and everything in its tortured condition; it will hate everyone and everything. “There will be gnashing of teeth” of powerless malice and the unquenchable fire of hatred. Tomorrow is Meatfare Sunday, marking the last day when Orthodox Christians will eat meat or fish in the fasting season of Great Lent. In light of tomorrow’s feast focussing upon the Second Coming of Christ and the Final Judgement, today is reserved as a “Soul Day” for us to commemorate any faithful Christian person known to us who has passed away. For those of us who have converted to Orthodox Christianity from other faiths, today is a poignant and thought provoking day; many of our beloved late relatives were not baptised and we pray for God’s mercy and compassion upon them. And do not show Thy good compassion to be dead. Since it often happens that certain people suffer death prematurely, in a foreign land, at sea, on trackless mountains, on precipices, in chasms, in famines, wars, conflagrations, and cold weather, and all manner of other deaths; and perhaps, being poor and without resources, they have not been vouchsafed the customary psalter readings and memorial services, moved by love for mankind, the Divine Fathers ordained that the Orthodox Catholic Church make commemoration of all people, a tradition which they inherited from the Holy Apostles, in order that those who, due to some particular circumstance, did not receive the customary obsequies individually, might be included in the present general commemoration, indicating that whatever is done on their behalf confers great benefit on them. For the remainder of Nikephoros Kallistos Xanthopoulos’ essay on the “Mystagogy” blog, click here.